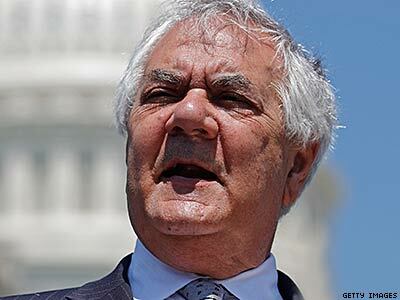 Former congressman Barney Frank is sticking by the decision to exclude transgender workers from protection under ENDA in 2007. Here's why that's still problematic. A few weeks back, Human Rights Campaign president Chad Griffin made news by issuing an apology to trans people everywhere during his keynote speech at the Southern Comfort convention. "So I am here today, at Southern Comfort, to deliver a message," Griffin said. "I deliver it on behalf of HRC, and I say it here in the hopes that it will eventually be heard by everyone who is willing to hear it. HRC has done wrong by the transgender community in the past, and I am here to formally apologize." Griffin's speech inspired both praise and skepticism from transgender people across the country. The relationship between the organizational behemoth and trans people has been a rocky one, to say the least, marked by a variety of conflicts. Among them: last year's incident when an HRC field director chastized a trans activist at a protest outside the Supreme Court as the Defense of Marriage Act case was proceeding, saying, "Marriage isn't a transgender issue," and the group's infamous decision to endorse a trans-exclusionary version of the Employment Non-Discrimination Act in 2007. It seems, however, that Griffin and HRC are operating in good faith, and that they truly do wish to mend these old wounds. From Griffin's appearance at Southern Comfort to the organization's statement in support of ending trans-exclusionary policies at music festivals, it seems that the group is making strides in the right direction. This is a good thing. That's what makes former congressman Barney Frank's response to question about Griffin's apology so bizarre. In the Georgia Voice, Frank dug not only into Griffin but into trans people as well. "Chad Griffin’s one of those people whose political judgment seems to be off," Frank said. "The fact is that HRC, and I, and everybody else were for an inclusive bill in 2007. The issue was we did not have the votes for an inclusive bill. It wasn’t a failure of will. Then the question was, was something better than nothing? Was it better to pass a bill that was protective of lesbian, gay and bisexual people or pass nothing? We tried very hard." The question of whether passing something was better than passing nothing is a tough one. It's worth noting that if Frank's bill would have passed the House, Senate, and was somehow signed into law by then-President George W. Bush — though he had openly stated that he would veto such a bill — yes, discrimination on the basis of one's sexual orientation would have been made illegal. By leaving gender identity and expression out, however, many LGB individuals would have still been vulnerable to job loss as it would remain perfectly legal to fire a masculine-presenting woman or a feminine-presenting man. Those viewed as somehow outside of what society expects from us in terms of gender would remain a target. Fixing this gap and passing a stand-alone bill to protect people against discrimination based on gender identity and expression would have taken decades. In late 2002, New York passed a statewide nondiscrimination bill that like Frank's covered sexual orientation while excluding gender identity and expression. At the time, legislators faced a similar dilemma: Should they vote down the bill and hold out for a fully-inclusive piece of legislation, or should they take what they could feasibly get at that time? The legislature passed the exclusionary bill, and a gender identity and expression-inclusive bill has been introduced every year since 2003, failing to become law time and again. New York, a state that hasn't voted for a Republican in a presidential race since 1984, cannot pass a stand-alone bill to protect workers from discrimination on the basis of gender identity or expression. If there's one thing Barney Frank should have taken from all of this, it's that together we truly are better. When we leave our most vulnerable to fend for themselves, they're only being set up for further failure. "The transgender community had this mistaken view that if Nancy Pelosi waved a magic wand, transgender would be included," Frank continued in his Georgia Voice interview, discussing 2007's ENDA. "And we were insisting to them that, look we don’t have the votes, help us lobby. Instead of trying to put pressure on the people who were against them, they thought they could just insist that we do it. We said, ‘We’re trying, but we need your help.’"
That statement — that transgender people simply weren't doing enough to help lobby for the bill — is disappointing and ignores the large number of transgender activists who have worked tirelessly on these causes for years. After all, Frank's premise, that it's better to have something than nothing, fails to take into account that what he was doing was merely symbolic in nature, as the bill had no chance of becoming law, whether or not it made it out of the House. Then-congressman Anthony Weiner was one of the loudest voices against Frank's decision to exclude trans people, giving a fiery speech on the House floor in the days before the vote. "There is an active discussion going on in this chamber and elsewhere whether or not to include gender identity in the same category we include sexual orientation," Weiner said. "I say, unequivocally, the answer is yes." Later, he added, "If we are going to make a symbolic stand, the symbolic stand should be ... that we are sticking together, that when we say 'GLBT,' we mean it." So why is it that when one group, a group that has been taking solid steps to toss aside its reputation as being against transgender people, admits it made a mistake, that others like Frank feel the need to say the apology demonstrates a lack of political judgment? Why is it that someone who now makes tens of thousands of dollars per speaking engagement as a type of "face of LGBT rights" continues to harm the people he claims to support? As humans and as organizations, we're bound to make mistakes. That's life. The best we can do is atone for our mistakes and make sure we do our best to avoid repeating them. I believe Chad Griffin's mea culpa was a courageous first step in mending the wounds of the past. Yes, HRC made a mistake — a big one. The group is owning that now, and that's worth something. It's a sign of growth and maturity. As for the people who seven years later cling to this idea that their provably flawed approach was the correct one, I believe they're in need of some self-reflection. Instead of blaming trans people for their exclusion from a bill, we should ask why it was ever appropriate to consider these individuals pawns to be used as concessions in political negotiations. Thank you, HRC. Former representative Frank could learn a thing or two from you. PARKER MARIE MOLLOY is the founder of Park That Car and works as a freelance writer. She has contributed writing to The New York Times, Rolling Stone, The Daily Beast, Slate, Salon, The Huffington Post, and Talking Points Memo as well as The Advocate. Additionally, she regularly contributes opinion entries to RedEye Chicago and writes a weekly column at HelloGiggles. She is a 2014 Trans 100 honoree and was named to Windy City Times' 30 Under 30 list. Follow her on Twitter @ParkerMolloy.